The word gourmet is relative. Especially when it comes to long distance backpacking. As a foodie and a long distance backpacker, I struggle to find a compromise. Here is a sample of one of my recipes that takes a little extra time to make, but the reward is worth it! Homemade potato salad holds fond memories for me, of family get-togethers and summer BBQs. I recently wondered if it could be something that I could replicate for the trail. More than half of all my recipe ideas fail when I try and make them a reality. This one turned out creamy, savory, and delicious–and only requires cold water to rehydrate. Although it isn’t light, it’s definitely coming along with us this summer. Package it up: In a ziploc baggie, mix potatoes, celery, onions, sugar, salt, pepper, garlic powder, and dill. In a pill baggie, package a sprinkle of paprika. Into the large baggie, throw in the small baggie of paprika and the unopened packets of mayo, vinegar, mustard, and bacon bits. Remove all of the packets from the large baggie containing the potato mixture and add just enough cold water to the baggie (or in your cook pot) to just barely cover the mixture. Don’t add too much water; you can always add more. Let sit about 10 minutes or longer (if you can wait for about 30+ minutes, it will come out even better). 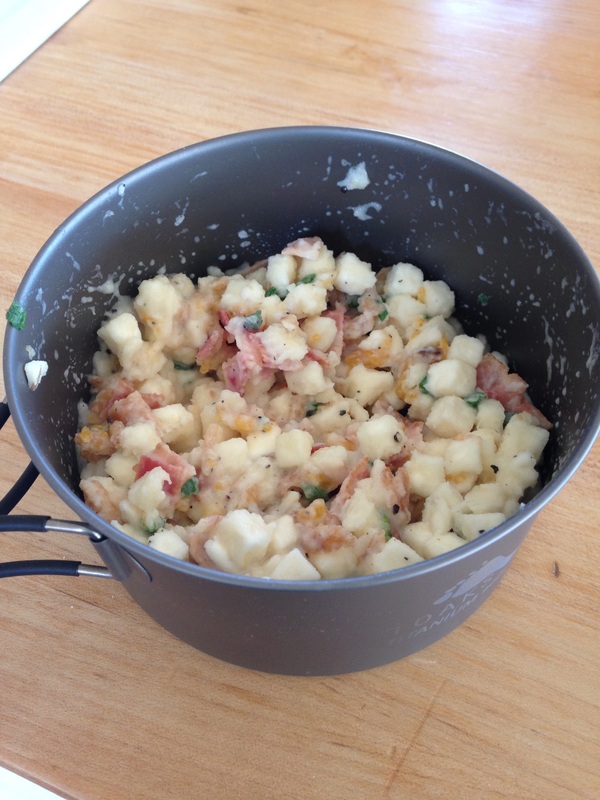 Once the potatoes have softened, add the mayo, mustard, vinegar, and bacon bits. If you brought an egg, chop it up and add it now. Stir to moisten the whole mix. Sprinkle paprika on top. Let sit another 5 minutes to let the flavors meld. Eat! Makes 2.5 c. salad and provides 655 calories. If you liked this idea, check out my other Gourmet Trail Recipes. No way you would put this much work into trail food? Check out my articles entitled Favorite Easy Trail Recipes. New recipes coming soon! At home, hummus is one of our go-to snacks. You buy dried hummus, but the quality and calories are lacking. On a whim, I tried drying it myself and I was surprised how easy it was and how good the finished product was! I only list this as a “gourmet” recipe because it does require a food dehydrator or an oven. Pita chips or tortillas pack nicely and, in combination with the hummus, make a great stand alone snack or meal. If you are using a dehydrator, set it to about 100F. If you are using an oven, set it on the lowest possible setting, preferrably 180F or below. In the dehydrator, the hummus will take about 8-10 hours to dry. When it is done, it will crack and easily flake off of the trays. In the oven, it will only take about 1 hour, so keep your eye on it. You don’t want to cook or burn it. About 5 minutes before you want to eat, pour just enough (cold) water onto the dry hummus to cover it. Do no add too much water; you can always add more, but it’s hard to take out. Let it sit 5 min. Stir again. If it is not creamy enough, add a tiny bit more water or up to 1 T. olive oil. That’s it! This is a non-cook, creamy, graham cracker-crusted cheesecake that is pretty easy to make in the backcountry. It works best with a large diameter pot and in cooler temps. The ingredients list makes 2 full cheesecakes! First, divide the recipe into two portions and repackage (if you care if it resembles a cake). Separate 1/2 of the “Crust mix” (about 1/2 c.) into two separate ziplock baggies. Add one T. sugar (3 packets) to each baggie of crust mix. Then, divide the filling mix equally into two separate baggies in the same way. Add 1/4 c. dried milk and the dried berries to each baggie of filling mix. When ready, spoon the thickened filling onto the crust and distribute it evenly. If you have fresh berries, throw them on top. That’s it. Each cake makes about 2c., has 1100 calories, and weighs about 8.5 oz. packages. I hiked the PCT 10 years ago as my first long-distance hike. Last summer, I hiked my 10th long trail; I have made it my lifestyle. As such, I have had the opportunity to meet a lot of other hikers who have way more miles than I do. We have talked about our strategies for route finding, gear, and resupply. I’ve been relieved to hear that, like me, they have all made mistakes and changes over the years. The one thing I have learned for certain is that no two people do it exactly the same way. That said, I can tell you that a lot of people have made the same mistakes. Most of the time, these “mistakes” are just different ways to do things that make that individual happier/more comfortable on trail. Sometimes, these mistakes cost people a lot of money. And, occasionally, a mistake can cost someone their hike. Because resupply is the most obvious difference between backpacking and thru-hiking, it is the most intimidating part for many prospective thru-hikers, even if they have a lot of backpacking experience. This is also where I have seen people make their biggest mistakes. First, let’s talk about what resupply is. Since you don’t want to carry everything you need for a 5-month hike, you are going to want to replenish your consumables (food, fuel, TP, hand sanitizer, sunblock, maps, etc.). Fortunately–on the PCT–the route crosses roads at regular intervals (every 2-10 days) where you can go to town to resupply those consumables. There are 2 ways to do resupply, both have pros and cons. Let me talk about the pros of each. You are going to town already (all resupply strategies include towns unless you are fully “supported”–and even then you are probably going to want to go to town occasionally for a hot meal). You don’t have to adjust your hiking to account for post office hours of operation, which can be very limited in small towns. It may be cheaper than mailing boxes ahead, depending on how expensive the town/resort is. You can buy whatever food sounds good to you at the time (I can tell you, you will probably acquire odd cravings out there). If, for some reason, you can’t complete your hike, you will not have wasted time and money preparing everything ahead of time. Just a word on this last point. From what I understand, the attrition rate on the PCT is usually at least 50%. You are probably thinking, “that isn’t me”. So does everyone else! I was fortunate enough 10 years ago to be one of maybe 70 people to complete the trail. There were times I almost quit, despite my complete devotion to it. In fact, of the 10 long trails I have started, I have had to cut 5 of them short. There are so many variables when you are on a long trail, some of which are out of your control. I have gotten off trail due to injury, waterborne illness, family emergency, and lonliness. So, if you have bought all of your consumables in advance of your hike, you should be prepared (if you end up having to cut your hike short) to be stuck with a lot of trail food and potentially out a bunch of money. The alternative method is to do mail drops. 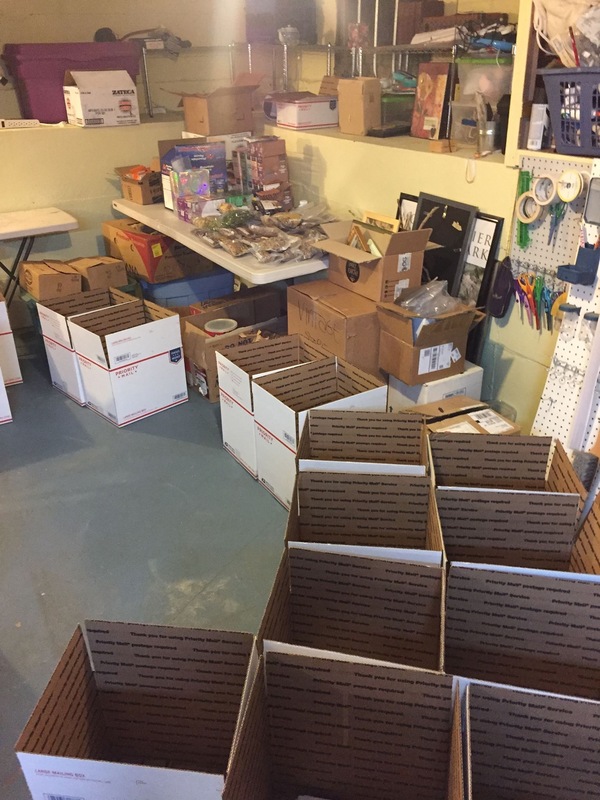 With this method, you mail a box to yourself in advance (usually via “General Delivery” at the Post Office) containing your resupply items for the next section of trail. Depending on the town or resort that you are going to, sometimes this is the more cost-effective method. Some resorts really have to elevate their prices to account for having to haul in supplies to their remote location. Mail drops are going to be very useful for people with specific dietary needs or who need hard-to-find items. If you are vegan or diabetic, or your headlamp takes a special battery, this strategy will make your life easier. A version of the maildrop strategy is the bounce bucket or box. A bounce box is a container that you mail to a town ahead of you on the trail. But, unlike mail drops, when you reach that town, you pick the box up from the post office (or hotel), collect just a few items from it, then mail it (and the rest of its contents) ahead of you again. 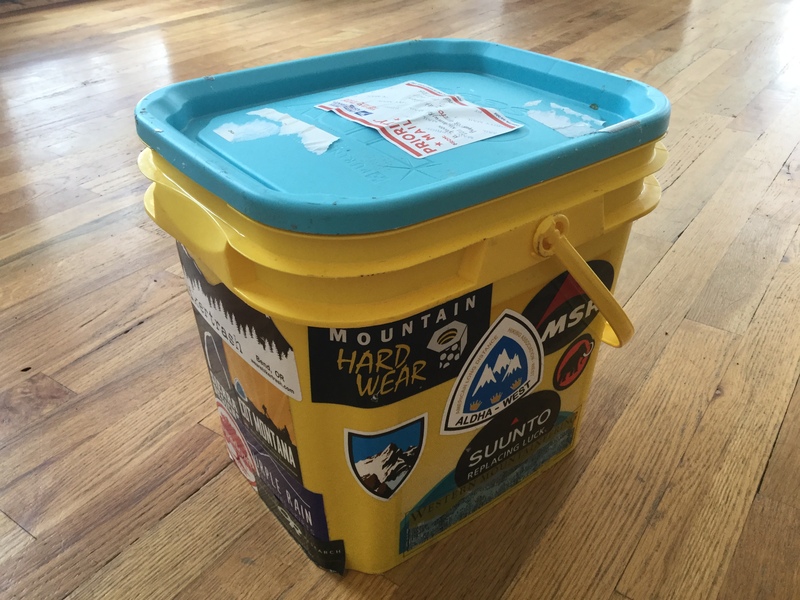 Some people actually use a 3 or 5 gallon bucket because it is durable and easy for the postal employees to find on the shelf (with two hundred other hiker boxes). Some items people put in bounce buckets/boxes are: backup socks, stakes, ground sheets, repair tape, pack liners, sporks, Platys, or other items that are likely to wear out or break. Also, some people like to include items for town stops like: a change of clothes (for when they do laundry), laundry detergent, razors, toenail clippers, hairbrushes, iPads, or a camera charger. Also, it may be useful to include items that you don’t want to buy a whole box of in every town, or are hard to find in some towns like: mini Body Glide, a ziplock bags, odd-sized batteries, a favorite drink mix, or medications. I like to include dried minced garlic, veggies, fruits, refried beans, cheese, and meats, plus packets of mayo, mustard, cream cheese, and Cholula. That way, I can buy whatever staples that sound good at the time in town and bulk them up with flavor, protein and calories! Note: Because you will probably out-hike the box if you try and do this at every town stop, I suggest, at most, only getting your box every other or every third town. The most common regret I hear, with regards to resupply, is from hikers who made every single meal for the trail in advance of the hike. It’s an easy trap to fall into in January and February when perspective thru-hikers want to be doing something productive for the big hike! Most hikers I have talked to about this have told me that their tastes, caloric needs, and cravings changed a lot throughout the duration of their first long hike. While I like scoring the yummy homemade meals out of the hiker boxes when they are sick of them (or they have to get off the trail), I feel bad for all of the wasted time, energy, and money. Another possible hybrid strategy is to do maildrops from a large town while you are on trail. For example, some people resupply for all of Oregon once they reach Ashland, the furthest south town stop in Oregon. This way, they have a better idea if they will be able to complete the trail, their food will be fresher, and they will have a better understanding of what their body is craving right then. If any of these terms are new to you, please refer to my Thru-Hiking Glossary. 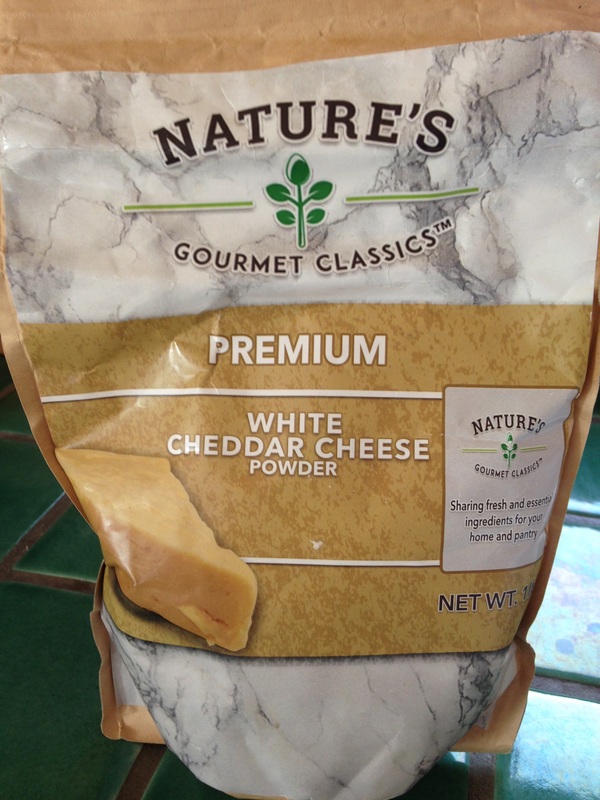 The word “gourmet” is relative. Especially when it comes to long distance backpacking. As a foodie and a long distance backpacker, I struggle to find a compromise. Here is a sample of one of my recipes that takes a little extra time to make, but the reward is worth it! Here’s a cheesy, oniony, bacony backpacking version of one of my favorite comfort foods. It also packs in the calories! Freeze dried potatoes are the only way to make this recipe with substance. Otherwise, you can use dehydrated mashed potatoes. Place first 6 ingredients in a pint or quart freezer ziplock bag. Place bacon and fried onions in a snack bag. Bring 1 c. water to a boil. Pour over potato mixture and let sit 5-10 min, until potatoes are tender. Stir in bacon/onion mixture. Eat! Makes about 2c., has 980 calories, weighs 5.8 oz. with baggies. If you liked this idea, check out my other “Gourmet Trail Recipes”. No way you would put this much work into trail food? Check out my articles entitled “Favorite Easy Trail Recipes”. New recipes coming soon! Okay, this one is kinda silly and I bet none of you will make it, but I love to go all out when I am hiking with a friend on their birthday–and make them a cake! Carrot cake is one of my favorites. It really helps if you have a fry pan and a canister stove that can burn really low. A wider diameter burner is better than a small one. A scorch buster doesn’t hurt either. You can probably make it in a 0.9-1.3L pot, but you will just have to rotate it around on the burner to make sure it doesn’t scorch. Put the cake mix, carrots/raisins, and egg replacer in a small ziplock bag. In a separate bag, package your frosting or frosting mix. To the cake mix baggie, add just enough water to make it cakey, but not too runny. Let sit about 20 min to allow carrots and raisins to rehydrate. If making your frosting, add a small amount of water to the sugar/milk mixture to make a thick glaze. Put a small amount of oil in the bottom of your fry pan and turn stove on its lowest setting. Squirt cake mix out of the baggie into the pan. Cover and allow to cook until you see holes from bubbles in the middle of the cake–about 2o min. (Note, I live at 8000′, so I don’t know how long it would take at sea level). Allow to cool slightly and add frosting. For those of you who like to get outside for the Thanksgiving holiday, or thru hikers who just want something savory and easy on trail, try this one! Place stuffing, potatoes, gravy, and Craisins in a freezer ziplock. Add very hot water to ziplock so that it barely covers the dry ingredients. About 1 1/4 cups. Let sit 1 minute. If you carry oil, add about 1 tablespoon to add flavor and about 100 calories. Add chicken/turkey. Makes about 3 cups of food. About 800 calories with oil.